Eye surgery brought together two School of Medicine alums. It was eye surgery that brought together two School of Medicine alums who graduated six decades apart. Fuchs’ Dystrophy was blurring the vision of Augusta Law, M47. 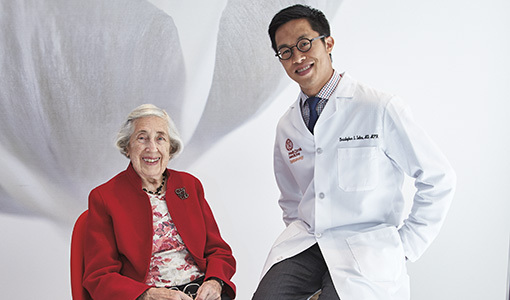 So when Christopher Sales, M09, MG09, a surgeon at Weill Cornell Medicine in New York who’s trained in Descemet membrane endothelial keratoplasty—a minimally invasive corneal transplant—came across her radar, Law traveled from New Hampshire to see him. Sales successfully performed the procedure on August 15.